The long history for this semi obscure, classified chateau dates all the way back to 1622, when the farm of Dauzac was owned by Jean Cousseau. His heirs sold the estate in 1671 to an order of Carmelite nuns. Fifteen years later, a new owner, Pierre Drouillard purchased the estate. It was the Drouillard family, who after forming a partnership with the well-known Lynch family turned the former farm into a vineyard. The Drouillard and Lynch families were already active in the Bordeaux wine trade as negociants. Together, they founded Chateau Dauzac. Pierre Drouillard died in 1708. In 1783, Chateau Dauzac was passed on to Jean-Baptiste Lynch. If the Lynch family name sounds familiar, that’s because they were the founders of Chateau Lynch Bages in Pauillac. In 1863, Chateau Dauzac was sold to Nathaniel Johnston III, the owner of a negociant still in business today. The Johnston family also owned Chateau Ducru Beaucaillou in St. Julien as well as Chateau Phelan Segur in St. Estephe. The Johnston family focused on selling the wines and delegated the wine making chores to Ernest David. By the end of the 19th century, Dauzac had become a laboratory for wine growing experiments and research that was headed by Ernest David. In 1914, with the death of Nathaniel Johnston IV, the Johnston family suffered heavy losses. In the 1930’s, unable to overcome the economic hardships brought on by the great depression, they were forced to sell Chateau Dauzac. In 1939, Dauzac was sold at auction. The new owner, a total newcomer to the wine world, Jean-Jacques Bernat was a well-known Bordeaux ice-cream manufacturer. Jean-Jacques Bernat brought new ideas to Bordeaux wine making from his expertise in the production of ice-cream. Notably temperature control of the vats using blocks of ice. In September 1978, Chateau Dauzac was purchased by Felix Chatellier, who renovated the Medoc estate, restructuring the vineyard and wine making facilities. Stainless steel vats replaced the old concrete tanks while the 19th century buildings gave way to air-conditioned cellars. The wine making was carried out under the supervision of Professor Emile Peynaud. In 1988, an insurance company, MAIF, acquired the estate from the Chatellier family. In 2002, the wine making facilities of Chateau Dauzac were modernized and a gravity based system was installed. Unfortunately, on acquiring Dauzac, the MAIF company did not also acquire the staff who knew how to make the wine and properly manage the estate. They quickly turned to Andre Lurton who agreed to take over and manage the Chateau Dauzac. In turn, Lurton also purchased 42% of the property. After twelve years, Andre Lurton stepped down in favor of his daughter, Christine Lurton de Caix, who took over running Chateau Dauzac. This branch of the Lurton family owns several other Bordeaux chateaux including Chateau Couhins Lurton and Chateau La Louviere in the Pessac Leognan appellation. That arrangement remained in place until 2014, when MAIF decided to take over managing Chateau Dauzac and purchased all the shares owned by the Lurton family. Today, Chateau Dauzac was owned by MAIF and Credit Agricole Grands Crus until 2018. In late December, Chateau Dauzc was sold to Christian Roulleau, the founder of SAMSIC, for 130 Million Euros. Samsic is a massive business services company, created in 1986. This was their first investment in wine. Here’s a fun fact for you. For the 2016 harvest, Chateau Dauzac invited anyone that was friends with the chateau on their Facebook page to join the harvest! Yes, Chateau Dauzac has certainly embraced the modern era. The 45 hectare Chateau Dauzac vineyard is planted to 68% Cabernet Sauvignon and 32% Merlot. This is a change in the vineyard. Previously up to 5% Cabernet Franc was found in the plantings. But those vines have since been removed. The vineyard is planted in one large, single block, which is quite rare, especially for the Margaux appellation. The estate also owns 4 hectares of vines in the Haut Medoc appellation. While Chateau Dauzac has 45 hectares under vine, they also own an additional 120 hectares of farmland, greenery and forest land at their estate. The age of vines are kept young, between 18 to 20 years. They have old vines, some of which are close to 80 years of age. But their old vines are not planted on their best parcels. Or with the correct rootstock, so slowly but surely, those vines will all eventually be replanted. The vineyard is planted to a vine density of 10,000 vines per hectare. Experiments are taking place on a tiny, .6 hectare parcel of Cabernet Sauvignon that is planted on its own, ungrafted rootstock. These vines are farmed using 100% biodynamic techniques. Other experiments are taking place at Chateau Dauzac including a search for alternatives to copper treatments created from alge coming from the local bay of Arcachon created by ImmunRise. The Left Bank vineyard of Chateau Dauzac has a terroir of gravel based soils in the southern end of the Margaux appellation. Part of what makes the terroir of Chateau Dauzac special is its access to the Gironde. The proximity to the water and its southern position on the appellation, and gives Dauzac a slightly warmer micro climate, so they often are one of the first 1855 Classified Growths to harvest in the appellation. Not all of the estate is planted with vines. Chateau Dauzac is a beautiful estate to visit, for its parkland, lakes and greenery surrounding the chateau. 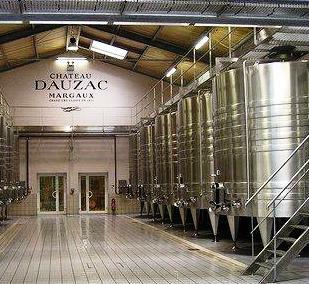 To make the wine of Chateau Dauzac, the wine is vinified in temperature controlled, stainless steel vats. Malolactic fermentation takes place in tank. The wine is aged in 50% new, French oak barrels for an average of 12 months. The wines are fined without egg whites as the estate uses plant based fining agents instead, making Chateau Dauzac a vegan wine. There is a second wine, La Bastide Dauzac. Starting with the 2013 vintage, the name of the second wine was changed to Aurore de Dauzac. On average, the annual production of Chateau Dauzac is close to 18,500 cases of wine per vintage. In addition, they also produce about 1,250 cases of Le Haut-Medoc de Dauzac from vines located in the Haut Medoc appellation. The best vintages of Chateau Dauzac are: 2018, 2017, 2016, 2015, 2014, 2012, 2010, 2009, 2008, 2005 and 2000. Chateau Dauzac can be enjoyed on the young side with decanting. Young vintages can be decanted for an average of 1-2 hours, give or take. This allows the wine to soften and open its perfume. Older vintages might need very little decanting, just enough to remove the sediment. Chateau Dauzac is usually better with at least 7-9 years of bottle age. Of course that can vary slightly, depending on the vintage character. Dauzac offers its best drinking and should reach peak maturity between 10-18 years of age after the vintage. Chateau Dauzac is best served at 15.5 degrees Celsius, 60 degrees Fahrenheit. The cool, almost cellar temperature gives the wine more freshness and lift. Chateau Dauzac is best served with all types of classic meat dishes, veal, pork, beef, lamb, duck, game, roast chicken, roasted, braised and grilled dishes. is a perfect match with Asian dishes, hearty fish courses like tuna, mushrooms and pasta as well as cheese. Dauzac also owns a small, 5 hectare parcel of vines located just outside the Margaux region in the Haut Medoc appellation. The wine is sold under the name of Chateau Labarde. Medium bodied and pashmina soft, there is a smooth sweetness emanating from the fruit. This is not complex, instead it offers a straightforward, laid-back moment of pleasure. The wine was produced from blending 69% Cabernet Sauvignon and 31% Merlot. Medium-bodied, fresh, soft-textured wine with nectarous fruits, earth and spice. Give this a few years to soften before you enjoy the juicy fruit finish. Medium/full bodied, the wine is fresh, lively, silky and infused with all the sweet, ripe, red and black fruits, flowers and tobacco you need, before the perfectly, soft, round, fruit filled finish kicks in. With a roundness to the tannins, and freshness to the red red fruits, this should drink well early, yet, develop more complexities as this medium bodied wine ages. Light, bright, and offering, simple, red fruits ranging from cherries to cranberry paired with floral notes, the finish is crisp and short. Short, medium bodied with bright red fruits, spice and earth in the dry finish. Definitely more interesting on the nose than the palate. The wine wa produced from a blend of 52% Cabernet Sauvignon and 48% Merlot, making it one of the largest percentages of Merlot in the Medoc. Medium bodied, with more red fruits than black, the wine has freshness, but the blend of 66% Cabernet Sauvignon and 34% Merlot lacks ample ripeness and concentration. From an assemblage of 64% Cabernet Sauvignon and 36% Merlot, the wine opens with coffee bean, fresh blackberries, plums and floral aromas. Round, soft and concentrated, this fun to taste, reasonably priced Margaux wine was a surprise, as I do not see it often. Young, masculine, firm, tannic, slightly more interesting on nose, with its floral, cedar wood, tobacco and blackberry notes, than on the palate, which leans to the austere side. This could improve if it softens with more age. Attention grabbing aromatics of flowers, black and red plums, cassis, smoke and licorice. Still tannic, this concentrated, round Margaux wine needs at least another 5-7 more years before it begins to express its personality. Medium bodied, and on the fresh, bright, red fruit style range, the texture is soft, marking this as mature and quite easy to drink. However, it is not a wine to hold, so if you have some, pop it over the next few years. This classic, old school, traditionally styled Margaux wine is medium bodied, slightly firm, fresh and lets you in on its cassis, tobacco, wet earth and red berry character. Ready to drink, there is a fresh, crisp tart edge to the red fruits in the earthy finish. Fans of this style of wine might enjoy it even more.